Ants live in little cities called ant colonies. 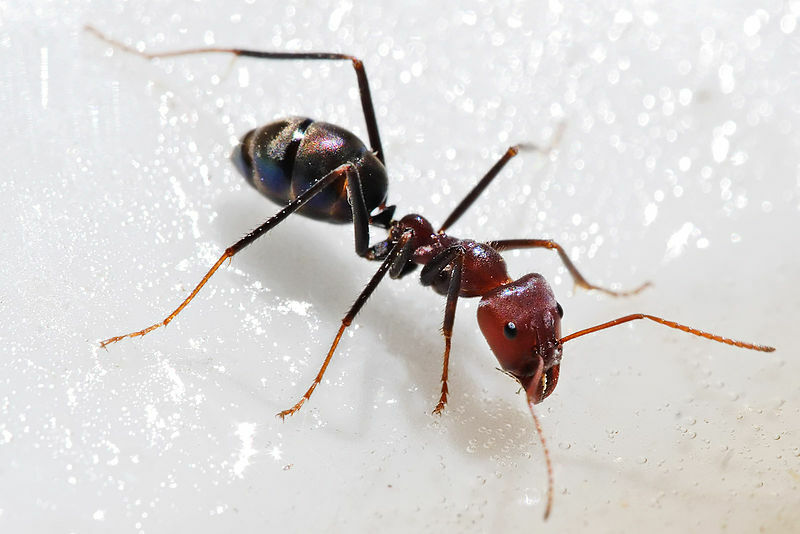 Species like the meat-eater ant eat mainly remains of dead animals, but also can eat other foods. Some ant species actually grow their own food by cutting leaves on which a type of fungus grows. Most ants work as a group to defend themselves. Whole colonies working together can act much like one large organism. More about Ants. An Aphid feeds on sap. 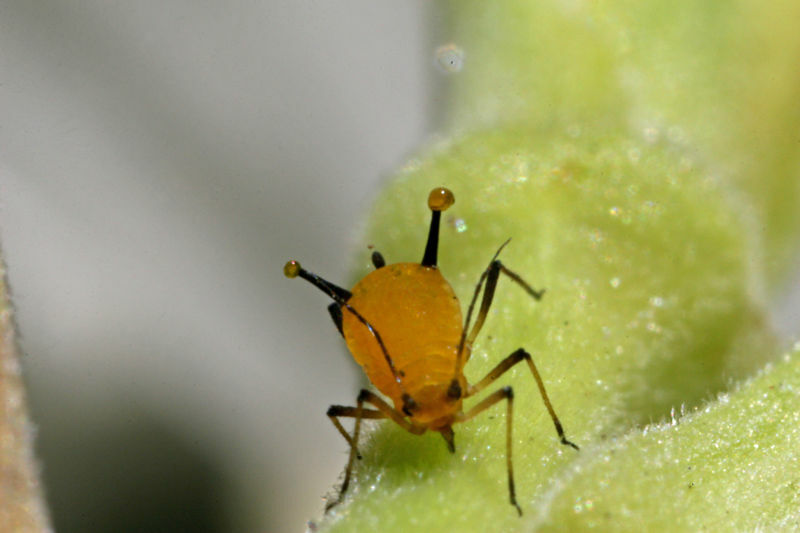 Aphids are small, pear-shaped insects with small heads and long antennae. Their length ranges from 1/16 inch to 3/8 inch. Some adults have wings, while others do not. The color depends on the species and the kinds of plants they eat. Aphids are found almost everywhere. The huge colonies that aphids produce make them the most destructive of all plant eating insects. More about Aphids. Bee collecting pollen to create honey. Bees are flying insects with two pairs of transparent wings. 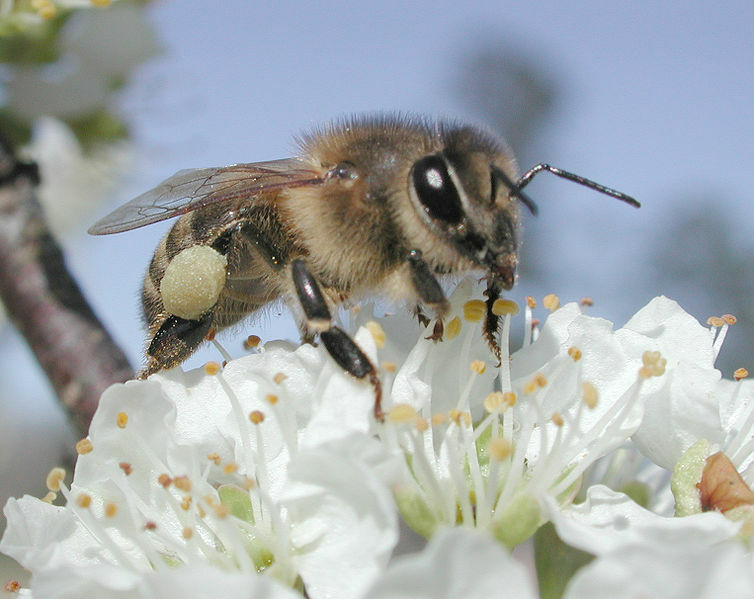 Honey bees have a hairy striped body, live in colonies and make honey. Honeybees are social insects and have large colonies, there are queen, worker and drone bees in different castes.Most bees eat nectar and pollen as their primary food. More about bees. 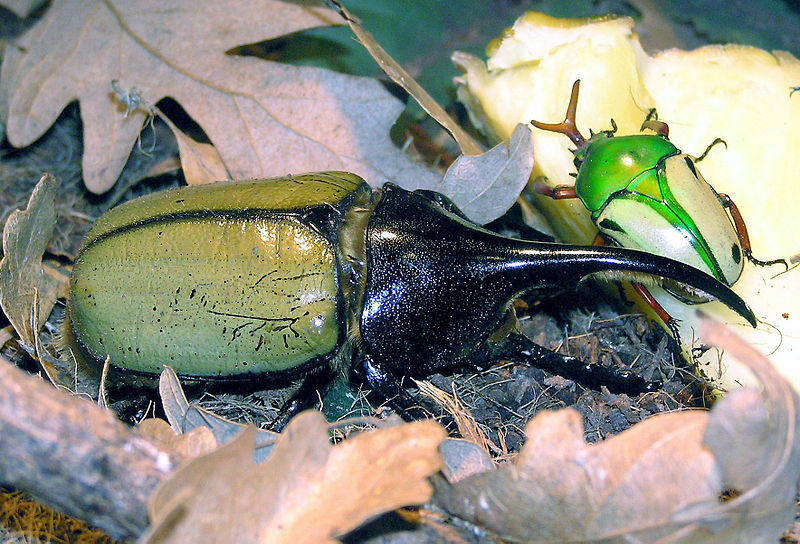 A Hercules Beetle (left) and a Jade Headed Buffalo Beetle (right). Beetles are an amazingly large and varied group of insects. Their bodies are covered by a hard, jointed, external covering called an exoskeleton. They have wings and most can fly. Beetles can be found all over the earth in all kinds of habitats. Some beetles eat other insects that harm crops. More about Beetles. Monarch Butterfly feeding on nectar from a flower. 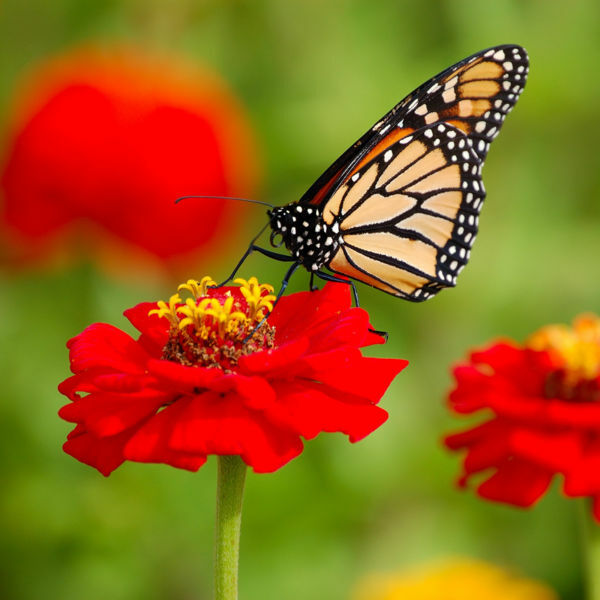 Butterflies are common insects that have a worm-like body and highly colorful wings.Butterfly larvae are called caterpillars.Each butterfly species eats specific types of plants.The caterpillar of the monarch butterfly feeds on the milkweed plant. Butterflies go through complete metamorphosis, which means that the adult form is very different from the juvenile form. More about Butterflies. A cockroach is similar to other insects, the body is divided into three parts. Wings overlap one another and lay flat over the back. They are succehssful because they have not adapted exclusively to one habitat or food. There are about 3,500 different species of cockroaches worldwide. More about Cockroaches. 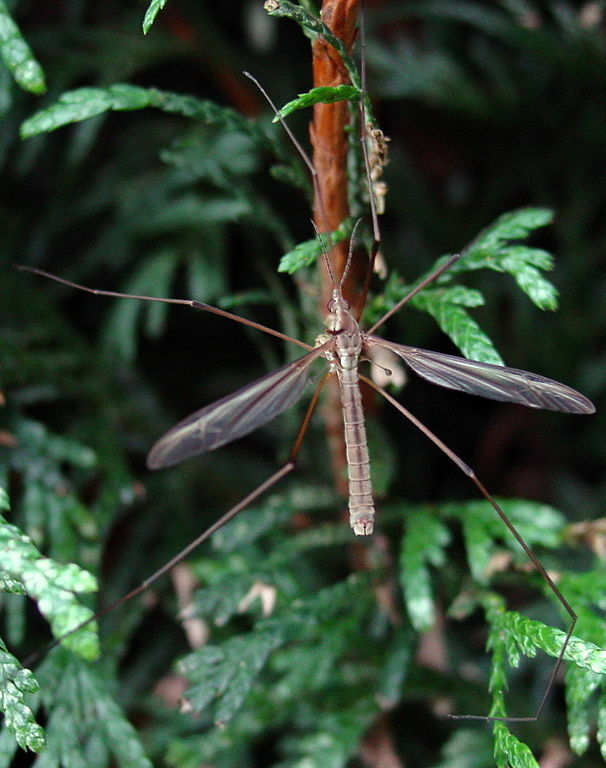 The adult crane fly is large and fragile with long slender legs. Body length varies from 1/8 inch to 3 inches. It looks a little like a huge mosquito. Long legs make it a relatively poor flier compared to other flies. At least 14,000 species of crane flies are found all around the world in temperate or tropical climates. More. Crickets are small, often nocturnal insects. They are usually dark brown or black and have six legs. Four are walking legs and two large back legs are used to make very long jumps. Attached to the head are two long antennae used for touching and smelling. Crickets are sometimes confused with grasshoppers. More. 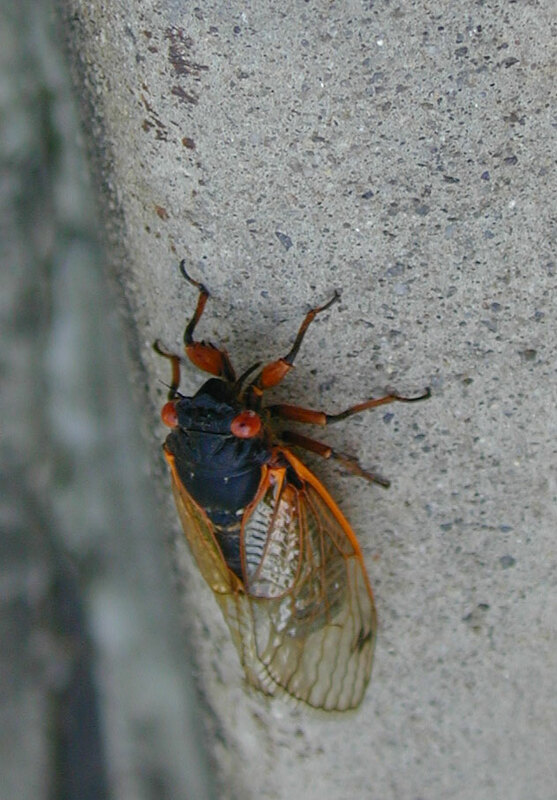 Cicadas are large insects between 1 and 2-3/8 inches long. They have a stout body, a broad head, and short antennae. Periodical cicada species (Magicicada) are found east of the Mississippi River from the Great Lakes to the Gulf of Mexico. Their habitat is deciduous mixed forests and nearby grasslands and pastures. 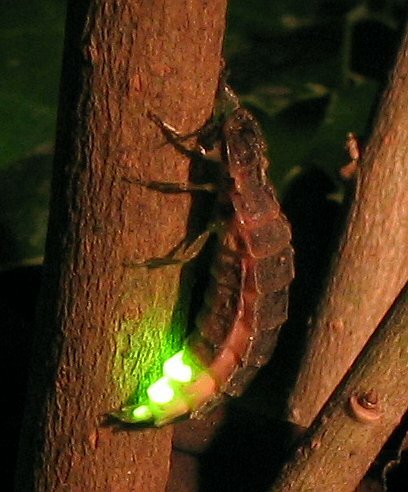 Unlike other cicadas, periodical cicadas emerge only once every 13 or 17 years. More. Dragonflies are jewels among insects. They have shimmering wings, large reflective eyes and a long body. Their wings are very delicate and lace-like, and are usually spread when they rest. 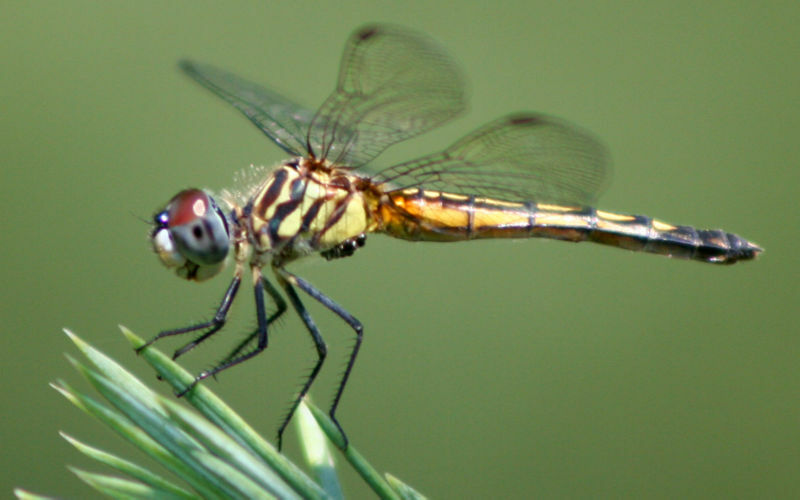 There are about 5000 species of dragonflies worldwide. About 450 species live in North America. More. House flies are the best known fly species. They have 6 legs, 2 antenna, and 3 body regions (head, thorax, and abdomen). Antenna bristles are slightly feathery. House flies occur worldwide except in Antarctica. 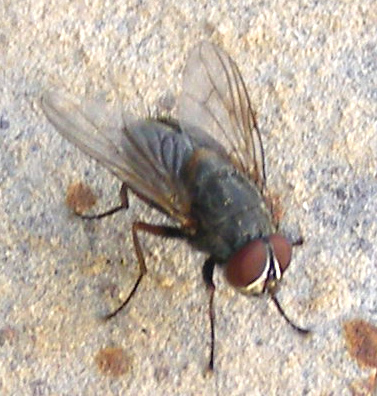 House flies carry germs that cause dysentery, anthrax, typhoid fever and other diseases. More.